• Broke through the traditional stereotype of thick gaming laptops, equipping top-end performances in a thin and lightweight body. • Equipped with the latest NVIDIA GeForce GTX 1080 graphics card but weighs only 2.2kg. • Exclusive cooling technology that increases airflow by 32% and lowers the temperatore by 20%, far better than traditional cooling designs. It uses the smallest case to provide maximum performance. • 144hz / 3ms monitor provides smooth gaming effects. 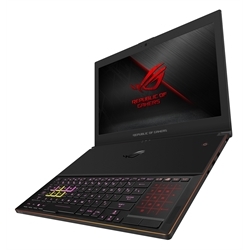 ROG Zephyrus is the world’s slimmest gaming laptop and incorporates the ROG-exclusive Active Aerodynamic System (AAS) — a specially designed cooling system. It also features customizable AURA SYNC lighting effects and an IPS-level panel with super-fast 144Hz refresh rate and ultra-responsive 3ms GTG response time, 100 percent sRGB color gamut and NVIDIA G-SYNC ™ for breathtaking gaming visuals.